If you’re at all concerned with the rising rates of childhood obesity and type 2 diabetes and if the fact that we’re the first generation predicted to live shorter life spans than our parents, this is a movie you can’t miss. 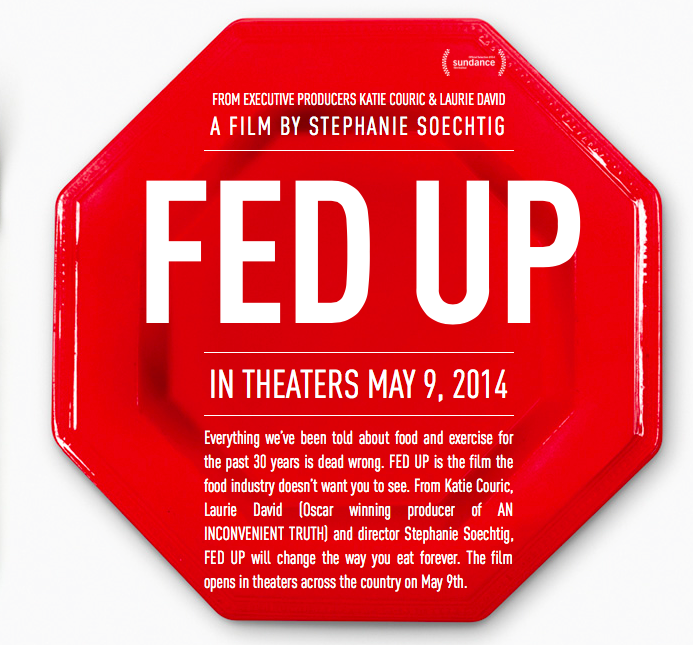 Narrated by Katie Couric, Fed Up tells the story of how our changing food supplies have a direct and profound effect on our health, including our weight. It teaches us that the conventional idea on calories in vs calories burned is a failed system that doesn’t account for the difference in calories; 100 calories from a banana are absorbed by the body, stored and burned much differently than 100 calories from a candy bar or any other food loaded with processed sugar. Fed Up follows the lives of several obese teens, as they continue to exercise and eat low fat processed foods and sugary diet sodas and, with tear filled pleas, wonder why they continue to gain weight. Fed Up hopes to prove the direct correlation between sugar and our declining health. It also opens your eyes to the deceptive marketing practices in effect and the power of the major food companies over our food supplies. “Once you see Fed Up and learn the the truth about sugar, we hope you get as Fed Up as we are with the state of our food environment. We are facing the biggest public health crisis of our time and the future of our nation depends on us taking action in our homes, schools, communities and workplaces. I was so happy to see this film end with a call to action. Their call to action involves a challenge that will prove to be one of the hardest you’ve ever done. Give up sugar for 10 days. If you’ve never tried to give up sugar, or think you’re not addicted to it, just try giving it up and you’ll realize how powerful and addicting sugar truly is. One comment from Fed Up that I couldn’t get out of my head is that ‘soda is the cigarettes of the 21st century’. Meaning we are addicted to a product and controlled by a powerful organization that leverages it’s financial contributions to our government. And we need to take that control back. Fight the power exerted by the packaged and processed foods companies by boycotting their products. And take the Fed Up challenge by signing up here today. “Taking the Fed Up Challenge and going sugar free is the first step. Giving up sugar will be tough because sugar is everywhere and we all crave it, but it can be done if we take it on together. Below are the steps we will be taking, tips for success, and resources to help you bring the Fed Up challenge to your community. FED UP is the film the food industry doesn’t want you to see because more of us get sick from what we eat than anyone ever realized. Produced by Katie Couric and Laurie David (AN INCONVENIENT TRUTH), FED UP blows the lid off everything we thought we knew about food and weight loss revealing a 30 year campaign by the food industry, subsidized by the US government, to mislead and confuse the American public.